You can now view Insta360 One X and Insta360 EVO photos and videos wirelessly on Oculus Go or Samsung Gear VR with the Insta360 VR app, which will be available on or around March 26. Here is how to use it. 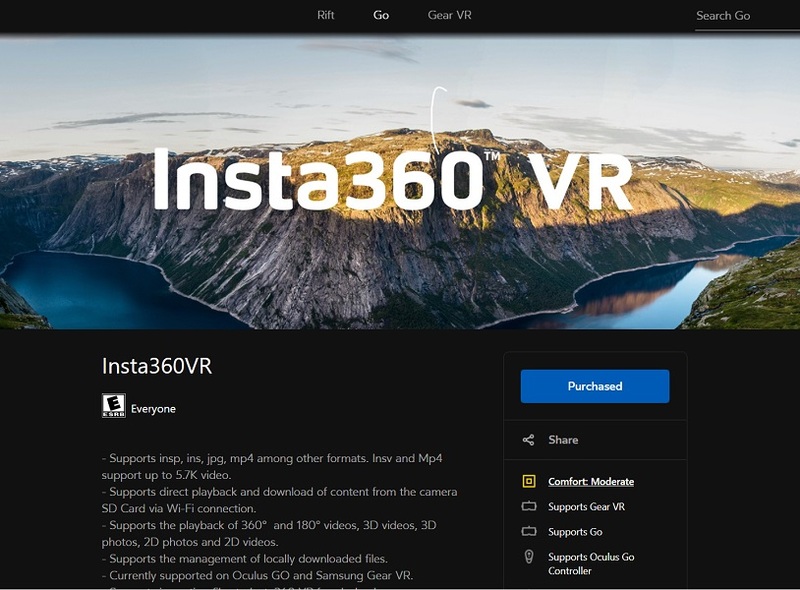 Insta360VR is a new app for Samsung Gear VR and Oculus Go that enables you to view your One X or EV photos wirelessly on Oculus Go or Gear VR without having to stitch the files or copy them. Insta360 VR can also view photos and videos from other cameras so long as they are in equirectangular format. You can download Insta360 VR for free from the Oculus store (search “Insta360”). 1. Turn on your Insta360 One X or Insta360 EVO, and your Oculus Go. Connect your Oculus Go or phone wirelessly to the One X or EVO Wi-Fi signal. – From within the Oculus Go: go to Settings, choose Wi-Fi and select the One X or EVO’s Wi-Fi. Watch Camera Files: watch photos and videos directly from One X or EVO. Use this option to view the photos and videos wirelessly. What is that “purchased” button ? When will this be available? I see Insta360 Moment on my Go, but it only works with Android phones. Great how-to. I would also be interested if it allowed for remote live view via the wireless link to the headset (insta 360 one x spec show 20m line of sight wireless distance for connection). For instance, if the 360 camera was further away (i.e. on a drone or mounted on one of our tall carbon fibre masts) and you could look around and control the camera using the 360 live view relative to head movements and handheld controller (i.e start stop rec, take photo etc). Still great as is though. Keep up the good work and reviews. Non biased and informative. Thank you. Thanks Tom. Yes you can use live preview, with head movement. And in fact it will be stabilized too. Just click on the google cardboard icon while in live preview. But you cannot control the evo or one x while in live preview mode. you’ll have to exit the live preview in order to start recording, take a photo etc. The post (and especially its baiting title) is misleading; it’s not available anywhere at this time. I just VPN’ed around the world, and nothing. Sorry my friend. I was mistakenly informed that it was released, but apparently not until March 26 (unconfirmed). I’ve therefore revised the title of the post. Is there PSVR support coming ? hi Alan. Let me try again and see.